And a dangerous Game brought it back to life. Seventeen-year-old Michael and his five-year-old brother, Patrick, have been battling monsters in The Game for weeks. In the rural mountains of West Virginia, armed with only their rifle and their love for each other, the brothers follow Instructions from the mysterious Game Master. They spend their days searching for survivors, their nights fighting endless hordes of “Bellows”—creatures that roam the dark, roaring for flesh. And at this Game, Michael and Patrick are very good. But The Game is changing. The Game Master is leading Michael and Patrick to other survivors—survivors who don’t play by the rules. And the brothers will never be the same. This week I focus my spotlight on Deadgirl by B.C. Johnson and Boy Nobody by Allen Zadoff. For this weeks From Page To Screen, I have decided to cover Les Misérables by Victor Hugo. Now for a bit of back story in case some of you aren't familiar with the novel. Les Misérables is a novel written by author Victor Hugo. The book was originally released in 1862 by A. Lacroix, Verboeckhoven & Cie. Les Misérables is a French historical epic that spans a total of 17 years. While critical reactions for Les Misérables usually landed on the negative side it was a commercial success. Fun Fact: The Character Jean Valjean is based loosely on the life of Eugène François Vidocq, an ex-convict who became a successful businessman widely noted for his social engagement and philanthropy. Let's take a look at the characters now, shall we. Expected Publication: May 21, 2013 For centuries, Wonderland thrived as the domain of beautiful bedlam and unapologetic madness. It was a place like no other. All it took was one girl slipping in through the cracks of the universe to start chaos spiraling toward order. In the 150 years since Alice’s visit, the realm has become tainted—almost normal. Rabbits in waistcoats and playing card minions are little more than creatures of myth, and Wonderland is literally falling to pieces. For Gwen, Rose, and Lucky, Wonderland is home, and yet they know little of its former glory. When the Alice prophecy resurfaces, they’ll have one chance to use Wonderland’s own legends to bring a little mayhem back into their reality. For she who controls Alice controls the fate of Wonderland. Books Purchased Ixeos by Jennings Wright Vampire Miami by Phil Tucker Desolate The Complete Trilogy by Robert Brumm Jr.
For this weeks Zurvival Saturday I wanted to dog something a bit fun by sharing my Zombie Apocalypse Celebrity Survival Team. I have to give credit to Gary's S.T.A.L.K.E.R. group on Facebook for giving me this idea. Without further ado, here are my picks! 1. Norman Reedus- Not only does he portray the badass Daryl Dixon on TV's The Walking Dead but I honestly believe he'd be a great guy to have around when the shtf. He seems like the type who could handle himself well and be an asset while still bringing common sense to the table. I wouldn't have to worry about Norman doing anything stupid like trying to save some ridiculous mansion in the Hollywood hills and he certainly doesn't seem the prissy type who'd be embarrassed by lack of hygiene in the event water plants shut down. So yup I'm claiming Norman for my team. On Pine Street, the houses begin to shake. The earth begins to move. The streets crack open and yards split asunder...and rising from subterranean depths far below, a viscid black muck bubbles up and floods the neighborhood. In it are a ravenous army of gigantic worms seeking human flesh. They wash into houses, they come up through the sewers, through plumbing, filling toilets and tubs, seeking human prey. It's time for another edition of Freebie Friday! Each week I compile a list of books that I've found for FREE and share them with all of you! All you have to do is click below each cover and it will take you to the purchase page. *Sorry for being late today. I had to run to the grocery store and ended up taking longer than intended. Anywho, here's the Books I've found. I hope you find something to enjoy! 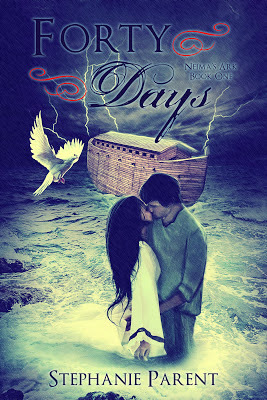 Welcome to my stop on the Forty Days blog tour hosted by YA Bound. Click HERE to follow the blog tour! …until the rain starts. And doesn’t stop. Soon sixteen-year-old Neima finds her entire world transformed, her life and those of the people she loves in peril. Trapped on the ark with her grandfather Noah, the rest of her family, and a noisy, filthy, and hungry assortment of wild animals, will Neima find a way to survive?